Gestating sows digest energy in diets more efficiently than growing gilts. A recent study from the University of Illinois is shedding light on some of the reasons why. “There are a number of factors that might explain the difference in energy digestibility between sows and gilts,” says Hans Stein, professor in the Department of Animal Sciences and the Division of Nutritional Sciences at U of I. “Growing pigs are allowed to eat as much as they want, but sows are generally restricted in their feed intake. This may affect the absorption of nutrients from the digestive tract and thereby increase the efficiency of digestion,” he says. Stein and Ph. D. candidate Gloria Casas designed an experiment to separate the effects of physiological stage and feed intake level. They fed diets containing corn, soybean meal, and rice bran to 24 growing gilts at 3.5 times their maintenance energy requirement. They also fed 24 gestating sows at 3.5 times maintenance, and 24 more sows at 1.5 times maintenance. 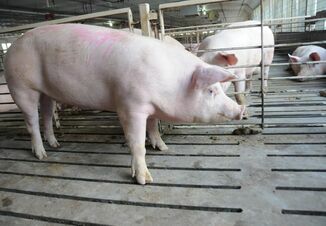 The apparent total tract digestibility (ATTD) of gross energy and organic matter in diets was greater in gestating sows than in growing gilts, but the ATTD of dry matter and neutral detergent fiber (NDF) was not influenced by the physiological stage of the animals. The concentrations of digestible and metabolizable energy in diets were greater for gestating sows than for gilts. In fact, there was no difference between sows fed 3.5 times maintenance and sows fed 1.5 times maintenance in ATTD of gross energy, dry matter, organic matter, or NDF. There was also no difference in concentrations of digestible and metabolizable energy. The article, “Gestating sows have greater digestibility of energy in full fat rice bran and defatted rice bran than growing gilts regardless of level of feed intake,” is published in the Journal of Animal Science. Is Strep Suis Making a Comeback?